experiences teaching at BASIS Independent Fremont, what motivates them, and some other fun questions. 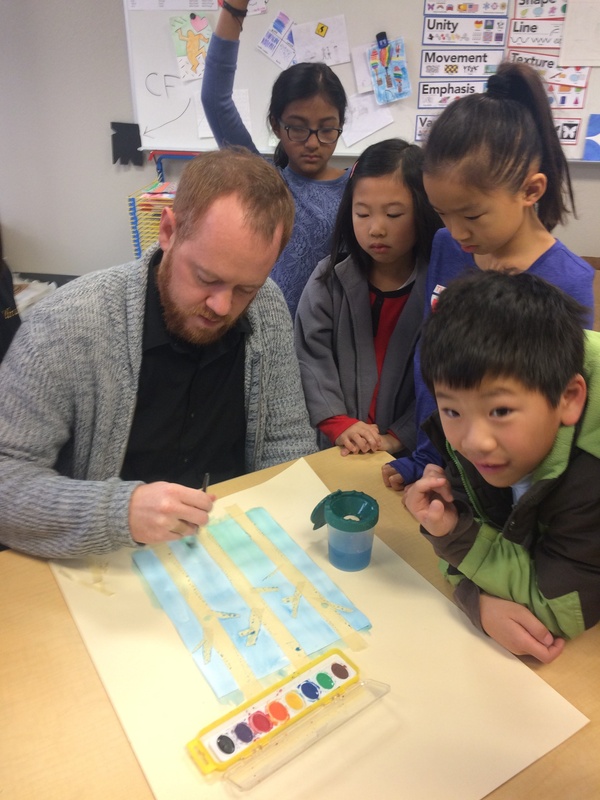 Today we talk with Mr. Kyle Harter, our Visual Arts Subject Expert Teacher. I absolutely love working at BASIS Independent Fremont! As a Subject Expert Teacher I am given the freedom, the resources, and the support to be the best possible teacher I can be. There's a general love of learning that is happening by teacher and students. You can feel it as you walk through the halls. The students at BASIS Independent aren't just "going to school,” they are getting an education. Be it through science, engineering, art, music, humanities -- they are taking ownership and are invested. So much so that they draw and paint about how much they love the school in my Visual Arts class and miss it on holidays. I am aware that not every student who walks through my classroom is destined to be the next Picasso. I do know, however, that every student who walks into my classroom has in them an innate quality of creativity. It’s my vision for students to walk away from my class having a deep appreciation for the arts, confidence, and a growth mindset about their own creative ability that will carry with them into any area of their lives. I am a working artist outside of teaching at BASIS Independent Fremont and enjoy showcasing my art in galleries and art events throughout the country. I also enjoy relaxing at home with a good book and some tea. In my undergraduate experience I was on the dean’s list and acted as lead illustrator on an award winning documentary. I then went on to be selected for Teach For America in 2013. With 57,000 people applying to the program, I was one of the approximately 6,000 of the applicants selected. In the 2015-16 school year, I was awarded Teacher of the Year at the school I placed in. That being said, my greatest accomplishment so far has to be my students and teaching at BASIS Independent Fremont. Also, the bamboo plant I have seemed to keep alive in home for the last four years. Its name is Capernacous. I always looked up to my teachers growing up. They were a major force of guidance and motivation for me. I think at some level I always knew I wanted to become a teacher, but I finally got to test that theory when I taught English abroad in South Korea in 2010. It was there that I realized how important it was for me to be a part of a community and how impactful I could be in the classroom. I came back to the U.S. and made it my mission to combine new found love for educating with my passion for art. Do you have a favorite quote or artist? A quote I use a lot when talking about my education philosophy is one by Pablo Picasso. He said, “There are painters who transform the sun into a yellow spot, but there are others who, thanks to their art and intelligence, transform a yellow spot into the sun.” While Picasso’s words and images inspire me, there are other artist that bring me joy. David Hockney, Alice Neel and Salvador Dali are just a few. In elementary school you could not pull the comic strip Calvin and Hobbes away from me. As an adolescent The Giver was a treasured read. In college I loved Ernest Hemingway, William Carlos Williams, and Alan Watts. Now-a-days I have been reading a lot of contemporary poetry and books on meditation. There are many people who have inspired me along my path. The first is my mother who made me believe I was capable of anything if I followed my heart and didn’t give up. My high school Art teacher, Mr. Chase, who allowed me the space to foster my own creativity. And Shel Silverstein who gave me this advice, "Do a loony-goony dance 'cross the kitchen floor, put something silly in the world that ain't been there before."